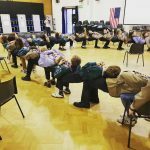 72 Scouts and 8 adult leaders from across West Sussex will be heading to West Virginia, USA in July 2019 for an international Jamboree adventure. 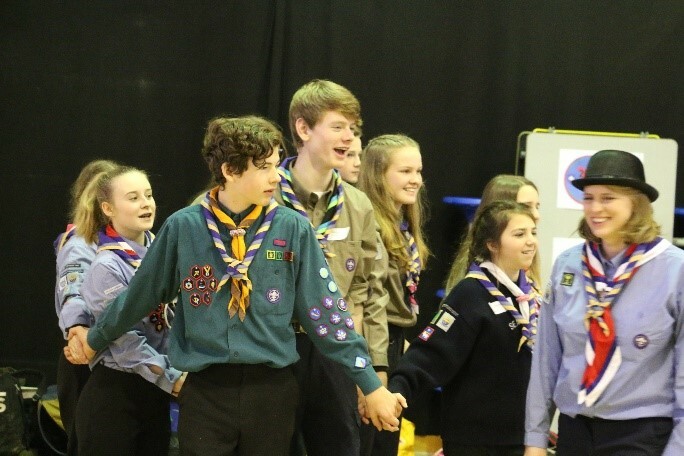 They were selected from over 200 applicants who had to attend selection weekends and interviews from across the County, to represent the UK at the event; and will be joining 4,000 Scouts and Leaders as part of the UK Contingent. West Sussex Scouts held a formal launch day on Saturday 27th January to signify the start of the Jamboree Journey at Tanbridge House School, Horsham. 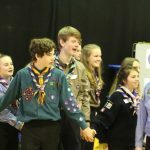 This was the first time many of the participants were able to meet each other and allowed the two Jamboree Units to be formed (Jamboree Units are arranged 36 Scouts and 4 Adult Leaders). It was also an opportunity to split the participants into Patrols and play some team building games like mingle, mingle, mingle, the human knot and make the shape. Throughout all of these, the patrols started to join up into what would be the final two units, after some false pretences! Attending the Jamboree is an opportunity like no other for the selected Scouts. Not only will they get to meet 45,000 people from nearly every country in the world and share their knowledge and experiences whilst working towards greater international understanding; the Jamboree offers them the chance to learn new skills that they can use in other aspects of their life. Provide opportunities for the participants to get to know each other, to develop the skills needed and prepare them for the life changing experience by running several training camps and days across West Sussex.